Directly by the sea front, on the south-east coast of Rhodes Island in the unspoilt landscape of Lachania, close to Prasonisi where the Mediterranean and Aegean seas meet, stands The Atrium Prestige Thalasso Spa Resort & Villas. Captivating scenery combined with palatial architecture and a stunning spa offer an experience created exclusively for those who know there is no such thing as too much luxury. The central building with its impressive wooden dome offers uncompromised sea views from all three descending levels. A water fountain gushes to the heights of the top entrance level and welcomes guests to the grand lobby overlooking the hotel grounds and the Mediterranean Sea. A colossal open-view terrace invites you to indulge in unique gastronomic experiences or just unwind at the bar. 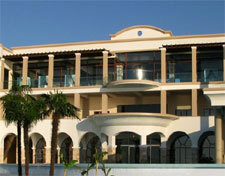 The sumptuous accommodations, just meters from the sea guarantee serenity and privacy.